The statue is surrounded by a new display. 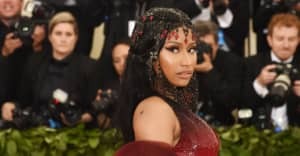 Several news outlets reported yesterday that Madame Tussauds' controversial wax figure of Nicki Minaj would be taken down. But in a statement issued to The FADER over email, Cole Kouvaris from Madame Tussauds Las Vegas explained that there are no "plans to remove the figure," explaining that the display was recently changed to make sure that museum visitors could still take pictures with the statue in a "respectful" way. "Nicki Minaj's wax figure at Madame Tussauds Las Vegas has not been removed, nor are there any plans to remove the figure," Kouvaris said. "The figure is currently on display and remains a popular addition to the attraction. We have adjusted the set in a manner that we hope will encourage guests to be respectful, yet still enable them to take photos."